I would tell them that that are extremely reliable and very efficient. I've been using them for many years, and they always stand behind their work. I like their expertise with which they complete their work. They're incredibly responsible and prompt. All of my dealings with them have been very positive. They know their stuff, they come out on time, and they're very cordial. I like their knowledge and their efficiency. They're pretty darn good. The employees are extremely competent, and they will go the extra mile if they need to. They're very easy to deal with, they do the work that they say they'll do, and they do it on time. It's never pleasant having major plumbing work done on your house, but I can't imagine anyone doing a better job. The people who I dealt with were absolutely great. 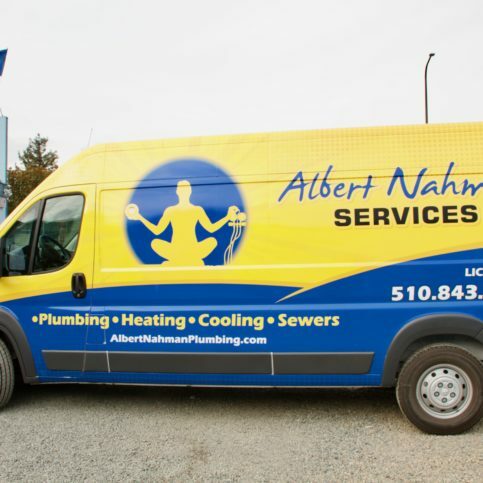 Albert Nahman Plumbing and Heating is a full-service plumbing firm that serves homeowners, apartment managers and building professionals in Alameda County. In addition to general plumbing repairs, the family-owned and operated company cleans drains; repairs, maintains and replaces water heaters (including tankless); provides trenchless sewer replacement services; and performs furnace repairs, tune-ups and installations with options for improved indoor air quality (IAQ). 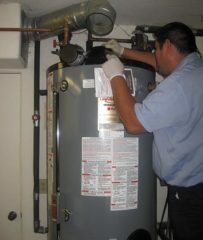 Albert Nahman Plumbing and Heating installs water heaters. 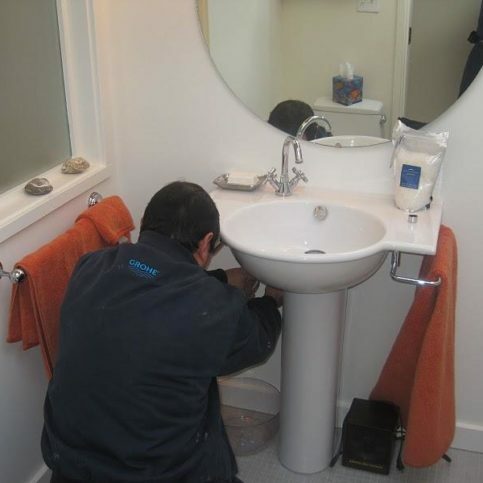 Most plumbers pledge quality, reliable work to their clients. 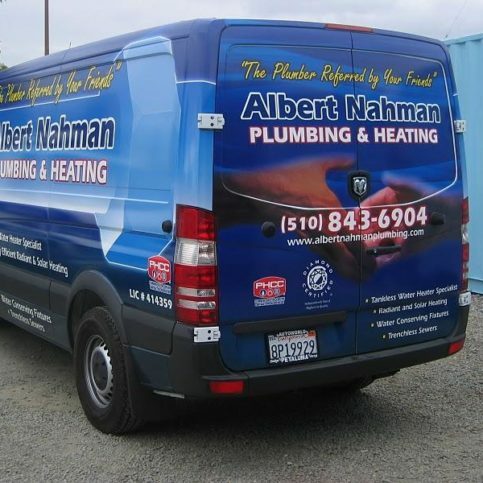 Albert Nahman Plumbing and Heating goes a step further, offering a full refund to any customer who isn’t 100 percent satisfied. 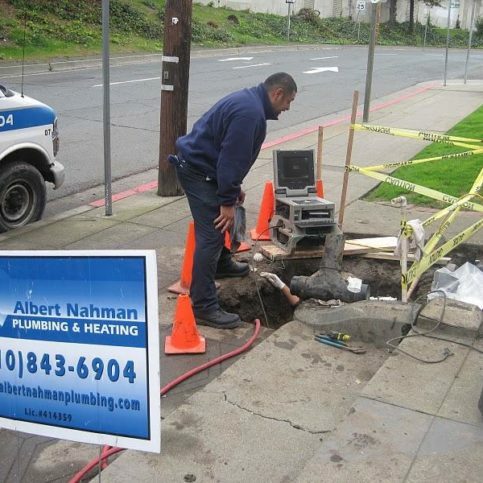 Since its inception in 1981, Albert Nahman Plumbing and Heating has consistently supplied exceptional plumbing service to Alameda County’s homeowners, apartment managers and building professionals, says Albert Nahman, the company’s owner. 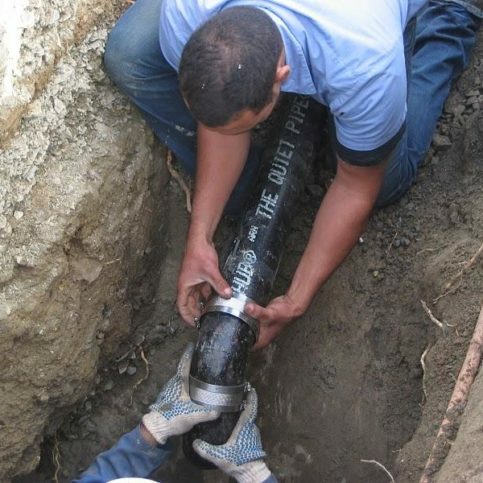 It uses a battery of advanced diagnostic tools to perform repairs and solve problems quickly and accurately–including water, gas and sewage system work, copper piping, water main replacements, trenchless sewer replacements and water heater installations. 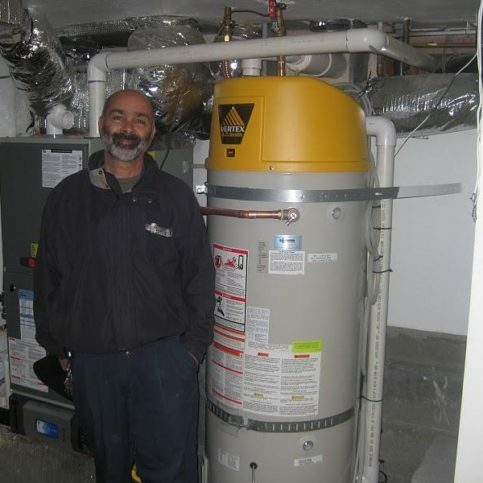 An early supporter of energy saving products, Albert Nahman Plumbing and Heating has come to be locally known as a tankless water heater specialist. 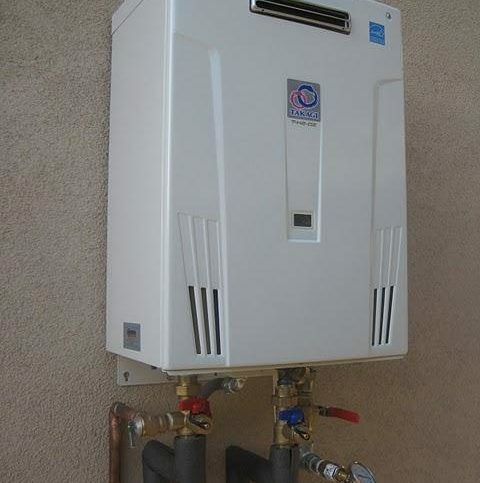 It has installed and serviced all models of tankless water heaters for more than 20 years. Mr. Nahman’s team of experts also offers a full range of home improvement services, from renovating an entire kitchen and bathroom to simply upgrading existing fixtures to improve their efficiency. The company calls itself “The Plumber Referred by Your Friends,” reflecting Mr. Nahman’s philosophy that customers will reward consistently excellent service with good word-of-mouth referrals. That strategy has won his company a loyal base of longstanding clients. Albert Nahman Plumbing and Heating’s policy is to quote all jobs up front. That way, customers don’t pay extra for a job that may take a bit longer than planned or discover mid-project that a special part needs to be ordered. Another unique offering is the company’s Diamond Club: for an annual membership fee, customers receive yearly check-ups of all their plumbing systems. According to Mr. Nahman, The Diamond Club has helped many customers ward off an impending plumbing disaster. Moreover, since the membership fee is applied to the cost of any necessary repairs, the club often ends up paying for itself. What if your plumbing work is warrantied but your plumber goes out of business? One way to sidestep this problem is to hire an established plumbing contractor with longstanding ties to the community, explains Albert Nahman, owner of Albert Nahman Plumbing. For the same reason, Mr. Nahman recommends you hire licensed plumbers, simply because they’re more likely to stay in business for the long run. “They’re the people who are going to be around to take care of any problems that might develop in the future,” he says. You’ll also feel more secure when you hire a well-established outfit, knowing management has probably run background and driver’s license checks on employees. Mr. Nahman suggests you develop an ongoing relationship with a plumber, no different than you would with your dentist or doctor. There are clear advantages to doing business with someone you know and trust—not to mention someone who knows and trusts you. Regular customers can usually count on that extra measure of consideration, particularly in emergency situations. To protect yourself from a plumbing disaster, Mr. Nahman recommends having a reputable company perform a comprehensive plumbing audit to identify weaknesses in your system and suggest ways to address them. 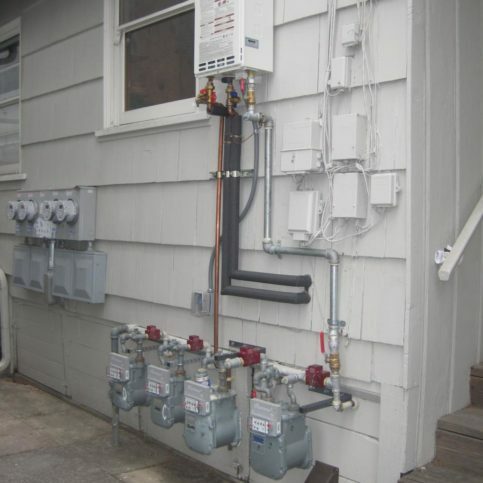 Another simple and effective way to protect your home is to install an automatic seismic gas shutoff. In the event of an earthquake, these devices will protect against potential gas leaks and fire. Q: Will I wait a long time for your contractors to show up? A: No. We give you a two-hour appointment window. We will also keep you updated on the technicians arrival time. Q: How are your warranties? A: Excellent. For new installations, it’s five years on labor and parts that we furnish. For repairs, it’s two years. Plus, we offer a 20-year warranty on complete copper repiping jobs and sewer replacements. As always, your complete satisfaction is our highest priority. Q: Do you have any thoughts for basic, everyday energy savings? A: First and foremost, get leaky faucets repaired. A drip can waste as much as 150 gallons a day. Be sure to check under sinks for moisture or small leaks. 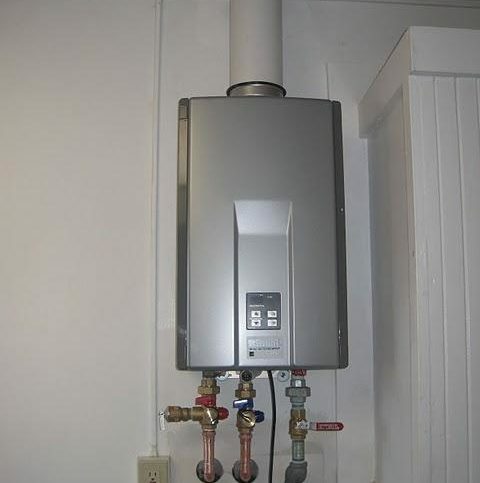 Q: What about maintenance for tankless water heaters? A: A tankless water heater should be maintained on a yearly or every other year basis to keep the manufacturers’ warranty in effect. 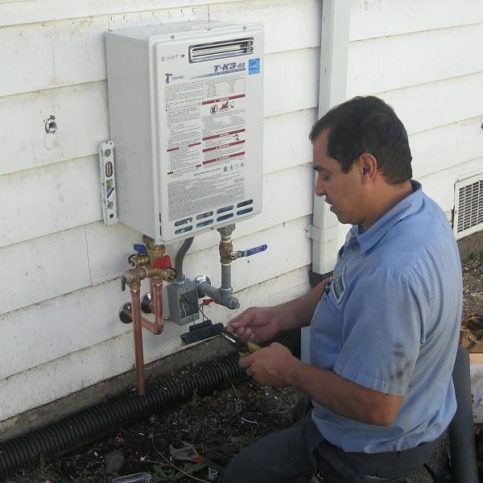 It is important to regularly service the tankless in order to keep it running efficiently. Some of the critical maintenance procedures would be to clean the inlet filter, check and clean the flame sensor rod, check for proper combustion, check for water and gas leaks and flush the heat exchanger. Q: Should my toilet be maintained as well? A: Toilet leaks can be wasteful and expensive. First, you want to make sure the toilet tank fills only after you flush and doesn’t run continuously. At least once a year, you should also check for leaks by adding a small amount of food coloring to the tank and then checking the bowl later. If you see coloring in the bowl, water is seeping through from the tank. 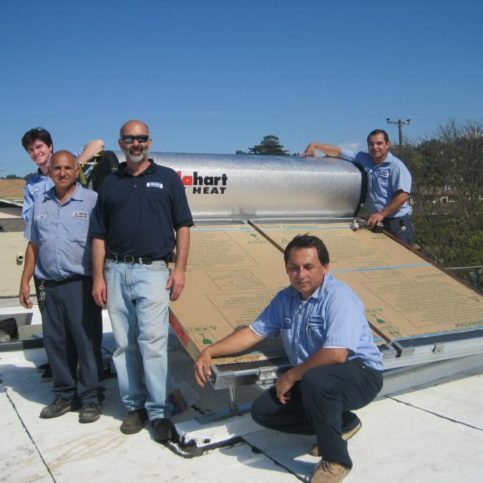 The company also performs solar hot water heating installations. 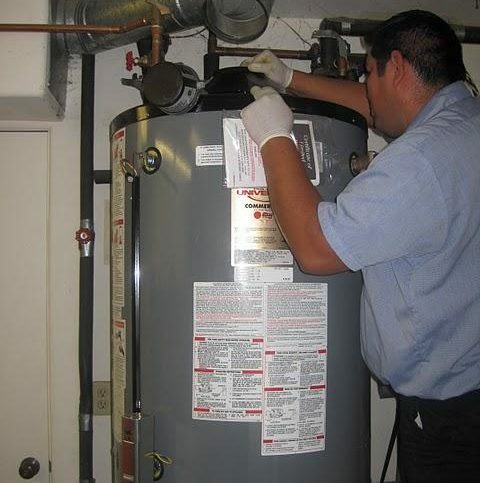 The company offers an array of plumbing and heating services. 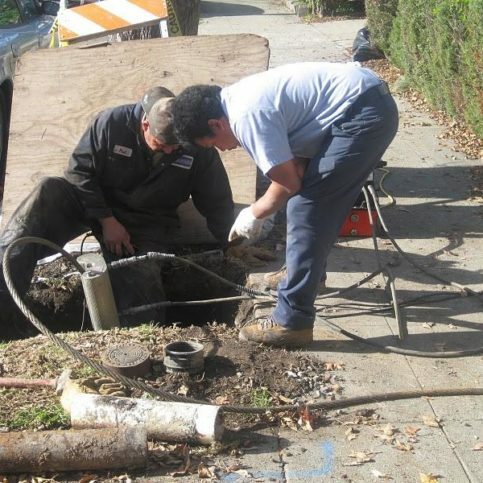 The company performs trenchless sewer replacements. Albert Nahman Plumbing and Heating does video inspections. Albert Nahman Plumbing and Heating installs gas shutoffs. 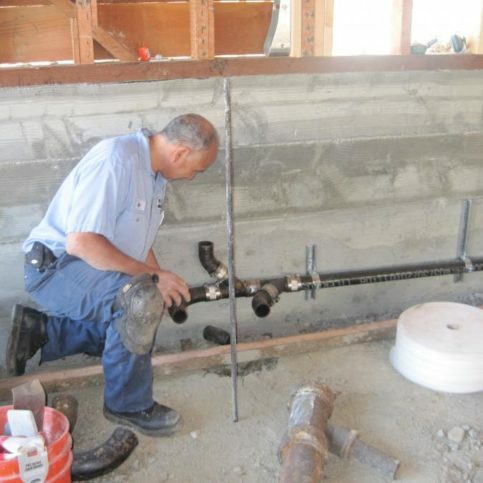 Albert Nahman Plumbing technician Rafael plumbs a rear outlet toilet. 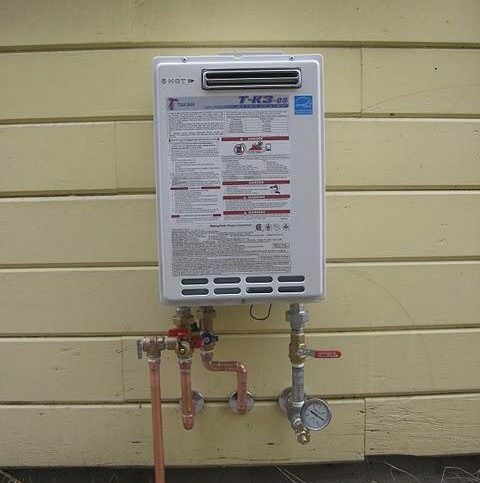 In addition, the company handles tankless water heater installation. An Albert Nahman technician replaces a sewer pipe. Albert Nahman is owner of Albert Nahman Plumbing and Heating, a Diamond Certified company since 2002. He can be reached at (510) 859-3990 or by email. Outside of work, Albert likes to stay active, whether with sports or volunteer work. “I’ve been playing in a softball league for many years, and so far they haven’t kicked me off the team,” he laughs. “I’m also a board member for Rebuilding Together East Bay-North, which rehabilitates homes for low-income and disabled residents of Berkeley, Richmond, and Emeryville.” Additionally, Albert enjoys spending time with family, including his and Marjorie’s three children and three grandchildren. A: A 1959 Ford Fairlane. It was the family car that was handed down to me, and people used to make fun of me because wherever I drove, a big cloud of black smoke followed me. A: Any kind of fruit pie, especially blueberry, raspberry or boysenberry. Put a dollop of ice cream on the side and I’m in heaven. Q: If you could speak to any famous person, living or dead, who would it be? A: I’d want to speak with somebody like Gandhi, the Buddha or Jesus—one of those people who actually figured it out, so to speak, and lived their life without letting material things get in the way. BERKELEY — If your home’s HVAC system is outdated, it might be time for an upgrade. Typically, this consists of replacing the central heating/cooling units and upgrading the ductwork and attic/crawlspace insulation. Since old, deteriorated ductwork and inadequate insulation detract from an HVAC system’s performance, addressing these related aspects will ensure you get the most energy-efficient performance possible from yours. You can expect a few benefits from upgrading your HVAC system, starting with increased comfort. With the improved performance of a new HVAC system, your home will be cooler in the summer and warmer in the winter. Also, installing a new HVAC system will lower your energy bills, which means your increased comfort will come at a decreased cost. An additional incentive to upgrade your HVAC system is the opportunity to take advantage of rebate programs. Right now, there are several rebate programs available to California homeowners who want to make energy-efficient upgrades to their homes, which will help offset the cost of equipment and installation. BERKELEY — Host, Sarah Rutan: To keep your furnace running at peak performance, there’s one crucial maintenance step you’ll need to perform. Today we’re in Berkeley with Diamond Certified Expert Contributor Albert Nahman of Albert Nahman Plumbing and Heating to learn more. Diamond Certified Expert Contributor, Albert Nahman: One tip I’d like to give homeowners is to change your air filters on your furnace frequently. It will help with the air quality and also protect your furnace so that it’ll run more efficiently. It’s a lot like changing your oil filters on your automobile. It will increase efficiency and protect the equipment. BERKELEY — Host, Sarah Rutan: If your home’s heating and cooling system is outdated, consider the benefits of upgrading it to modern standards. To learn more, we’re in Berkeley with Gabriel Kalmon of Albert Nahman Plumbing and Heating, speaking on behalf of Diamond Certified Expert Contributor Albert Nahman. Gabriel Kalmon: Well, there’s a couple different benefits when you talk about what you’re going to get out of your HVAC system. Number one, you’re going to get efficiency in the summertime, your house is going to be a lot cooler, and in the wintertime it’s going to be a lot more comfortable and warmer. Number two, your bills’ll be a lot lower. You’ll experience that, in the summertime, your bills are a lot lower, keeping the house cool, and in the wintertime, your heating bills are going to be a lot less as well, because of all the upgrades you’ve done. Number three, there’s the rebate program that we’re associated with. That rebate program is great for everybody who’s replacing an existing system and upgrading the duct-work, the furnace-work and in some cases you can get extra money back for doing the installation in the attic and the crawlspace that I mentioned before. 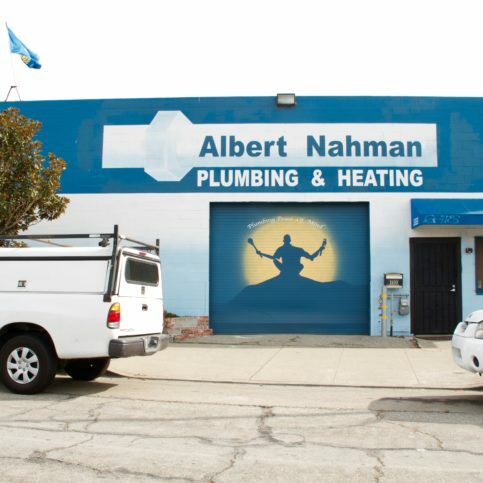 Albert Nahman Plumbing and Heating : Average 9.1 out of 10 based on 472 unique customer surveys of customer satisfaction. They are fast, professional, and the work is guaranteed. The owner himself came to check on the work, which I thought was a nice touch. They took extra steps to make sure the repair was done correctly. I like that the owner is able to be a part of the operation. They seem very down-to-earth and knowledgeable. They left the premises clean and neat. They are literally the best plumbers that we have experienced over the years. After the prompt response and timely arrival, the owner stopped by to check on the work. I have never had this happen before, and it really showed me how much they really do care about the quality of work they are putting out. The owner took the time to come out and confirm everything was done correctly. They were all so professional, from scheduling the appointment to the visit on the repair. They did the job correctly the first time. They were very professional, timely, and the price was competitive. They were good, so 10's across the board. We had an emergency with our kitchen plumbing, and they came the very next morning. They found the issue, got the parts, and had the repairs completed that same day. I think that they do things 100% and don't cut corners. I would highly recommend them to people. I have told a couple of friends about them already. They do really good work, and they are reliable. Nothing specific other than what I just said. There was a pretty bad flood in our house. They were able to come out immediately, get the issues repaired, and provided us with some recommendations on other things they saw that needed to be maintained. No pressure recommendations for the future. They are good. I highly recommend them. Get Anthony if you can. Fernando was on the spot and provided great service. They got the problem solved. The scheduling staff is very efficient and competent. They were able to get our water heater replaced within a few days. It looks great. Very professional, and they do what they say. They are informed and knowledgeable. They showed up on time and did what they were suppose to do. I didn't feel like they were trying to overcharge for anything. They fixed the problem and recommended other things that needed to be done. It was good. I was happy with them. The plumber, Anthony, knew exactly what he needed to do. They were able to schedule enough time for them to find the problem, run to the hardware store, and get the repair finished. They were a little pricey, but we haven't had an issue since. They fixed it right the first time. The guy who showed up was really sweet. He was good help. I was satisfied. They were able to solve an issue with our dishwasher and sink that two other guys couldn't. These guys have a lot of knowledge, a lot. They back their work, the scheduling was quick, and they were on time. Everything, now that I think about it, they were on time, got the job done, and did everything very professionally. They were good. I have kept their number for future reference. Fernando was great. I thought they were very expensive, but they had time to fix the problem right then, so I went with them. There have been no issues since. I'm glad I used them, because it got done right the first time. They fixed the issue right the first time, and the guy was really friendly.